Swimming Pool Conversion. Residential and Commercial Pool Conversions. We can eliminate all those vinyl liner nightmares by converting your swimming pool into a one piece fiberglass swimming pool. Fibreliner is the “world’s strongest liner” for commercial or residential swimming pools which allows Us to convert your vinyl liner pool into a one piece fiberglass eco-friendly swimming pool. Your new pool will actually be ten times stronger than a one piece fiberglass swimming pool insert and have seventeen times more flexural strength than a concrete swimming pool. 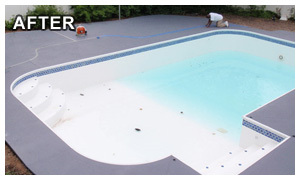 Additionally it will never have to be resurfaced again, thus eliminating all those high maintenance costs associated with vinyl liner swimming pools. Vinyl Swimming Pool Liners frequently leak. The Result, Wasted Time, Wasted Steps & Wasted Money. So, whether you own or operate a commercial in-ground swimming pool for guests or community members or you own a residential in ground swimming pool we can help you convert your vinyl lined swimming pool to a watertight fiberglass pool that saves you Aggravation, Money and Time! 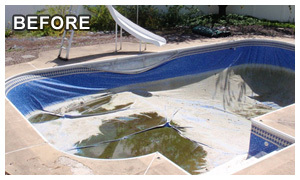 Contact us today for a professional replacement of your old vinyl liner and start enjoying your low maintenance fiberglass swimming pool!